During 2017, on our blog, we have repeatedly talk about the theme of evolution in office layout: the advent of mobile technology has, moreover, greatly widened the potential space for action of the worker, extending the operation also to the exterior of the office environment. In the most forefront companies this fundamental change has triggered a process of redefinition of the corporate environments, devoted to the optimization of work’s spaces: an optimization that on one hand can guarantee a considerable cost-saving to the company, and on the other side could improve the satisfaction and the level of employee performance. In the wake of this new approach, various concepts, mostly borrowed from the United States, gradually became common in the current language, able to frame a series of tendencies destined to become dominant in the coming years. So let's try to do a little focus on all these too many times abused terms! This is a new managerial philosophy based on giving back to people freedom and autonomy in the choice of spaces, time schedules and instruments for their work. As mentioned earlier in the last decade the way of working within the offices has changed radically: thanks to technology work has become more flexible, mobility has increased and - as a result - the need for a static work station for each employee has disappear. Computers and landline phones, paper archives, printers, photocopiers and oversized meeting rooms are quickly disappearing, giving the way to a multi-device worksystem where smartphones, tablets and notebooks are able to access to all the data and applications needed for work. With those kind of workers always connected, able to check work emails and manage phone calls even from home outside working hours, the trend seems to be more and more that of detachment from the canonical working day with fixed hours and work stations. A radical change that the academics have renamed inventing the phrase ‘Smart Working’: a complex concept that does not limit itself to indicate the possibility of working away from the office but that pushes us to rethink in a functional way how the activities can be carried out working from company spaces, removing ancient constraints and models linked to the concept of a fixed work location. 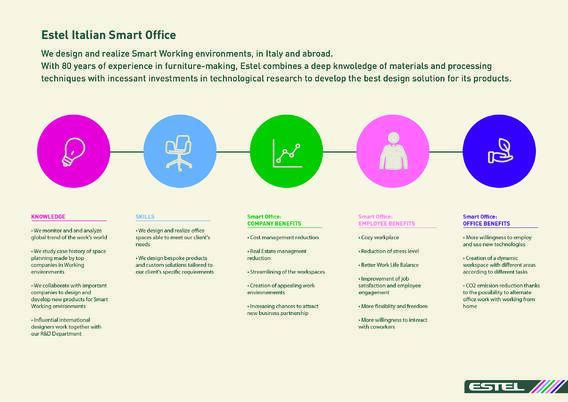 A new way of conceiving the 'office space' developed by Estel, in response to the spread of the Smart Working dynamics; this concept envisages the creation of dynamic spatial layouts, in order to adapt to the new organizational models (no longer based on the hierarchical principles of control, the formalization of roles and compliance with procedures but on key words such as accountability, objectives, involvement and flexibility) . The focus is not only on the quality of service offered to customers, but also on employee satisfaction. The ultimate goal is to design and build offices that help work according to contemporary rhythms and values, not only through the establishment of operational areas but by providing areas in which is possible to host and encourage people's flexibility and meeting. 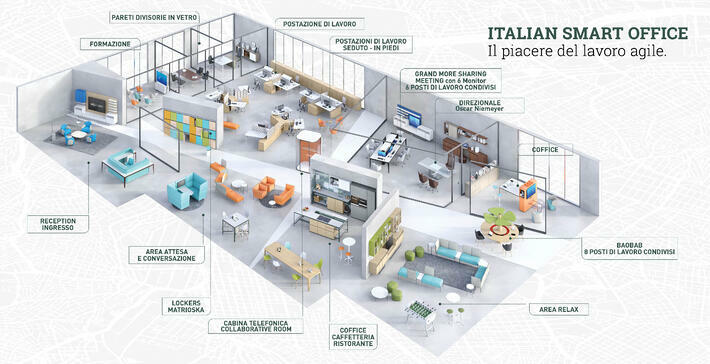 Meeting rooms, break areas, waiting rooms or training rooms become strategic points of the building: in this way, team work and the improvement of internal communication are encouraged. The Activity Based Working theory encourages companies to rethink their employees' approach to work. The basis of this theory is the idea that people perform at best a certain activity if they are "placed" in the right environment. Abandoning the concept of a fixed location, ABW believes that workers need flexibility and technology to perform their jobs better. This is a concept that strongly influences many aspects of the company organization, first of all the space planning activities of the work environments. In recent past the company offices have been designed as hierarchical environments, composed of "watertight compartments" divided in a very clear way as they are dedicated to the different functions (such as operating areas, conference rooms, meeting rooms ...), without ever considering the possible need to change from one to another activity to another quickly during the same working day. In modern companies, however, there is an increasing desire to create composite environments characterized by a great mix, where areas for different activities coexist side by side thanks to the use of technological solutions (for example through to the use of soundproofing glass walls or collaborative room acoustically isolated. 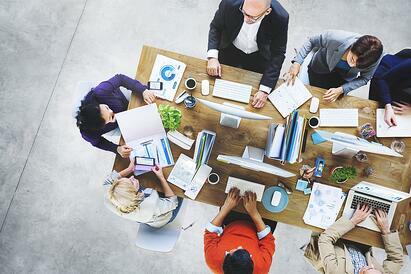 In the recent approach to space planning of working environments the tendency is to eliminate separation. In the most innovative companies there is conviction that only quitting with “stasis” can allow workers to express their full potential: in this context the closed and divided spaces seem a distant memory; the offices are now more open and connected, with environments predisposed to different work styles, respecting the theory of Activity Based Working. In the same area, for example, could be found areas for meetings and formal confrontation, acoustically isolated boxes for moments of focus and concentration and lounge corners that encourage socialization and informal moments among colleagues. An office layout with these different operating options will incourage and push employees to work in a more flexible and creative way and the concept of a fixed location is eliminated. An emerging theory elaborated by the famous Polish sociologist Baumann, within a more complex reasoning aimed at describing what he considered to be an evolutionary process underway in the society of the twenty-first century, in transition from modernity to post-modernity: the scholar described this transformation using the metaphor of a transition from a solid state (modernity) to a liquid state (postmodernity). While in modern age everything was given as a solid construction in our day, however, every aspect of life is remodeled artificially: in the field of work, for example, the meaning of the word “office” is no longer just a physical space in which people work, but a series of actions that can be carried out at any time and at any latitude. 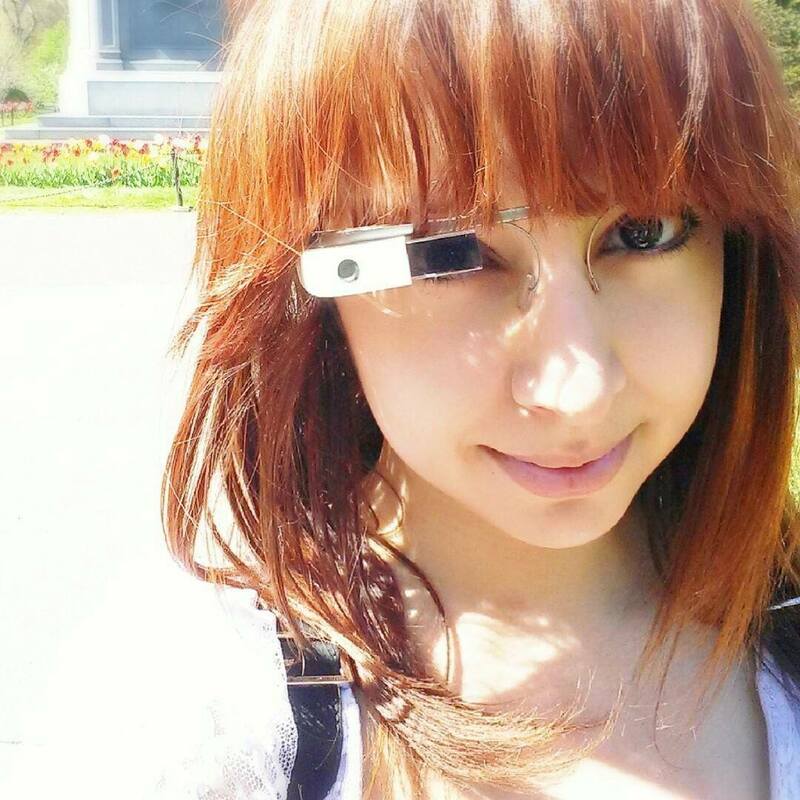 Even companies would be becoming entities with more labile boundaries, so much so that it would be very difficult for anyone to be able to frame a company in a single building or in any physical location. Within these liquid organizations, therefore, there are ways to work ever faster, more dislocated and flexible; on the other hand, if a worker finds himself working in a scenario in which he is always connected, it is impossible to avoid a redefinition of the relationship with the space and the work time. In this context, it is clear how communication and collaboration assume a primary role for the proper functioning of any company business: this necessarily entails a reorganization of company processes and work environments. Let's start from a simple fact: if we consider that an average worker spends a third of his day at work we can easily understand how the impact of the work environment can be significant for its well-being. In the past, when the work was mostly carried out in a very static manner, it was sufficient to provide employees with ergonomic seating, able to limit the onset of physical problems; today, however, this practice is no longer enough: thanks to technology work has become more dynamic, so much that during the course of the canonical 8 working hours the same worker could work standing, sitting and even moving. To create the best climate in a modern work environment it is therefore absolutely necessary to reflect on the activities that will be carried out choosing and placing in the best way furnishing solutions with specific technical characteristics. 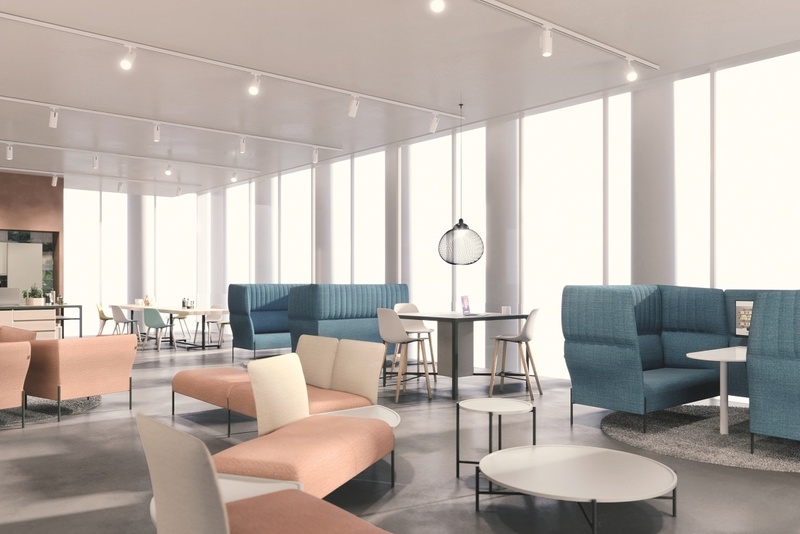 Within the company headquarters it is therefore important to prepare a series of varied work layouts such as height-adjustable desks, lounge areas with "relaxed" seating areas and isolated areas for meetings and concentration. To set up this layout in open space offices it is possible to use acoustic partitions to isolate areas for privacy, individual or group working moments. 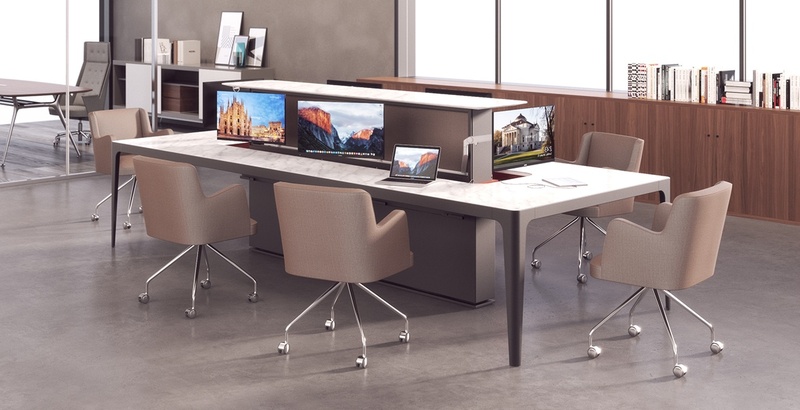 A correct mix of collaborative and private spaces allows people to organize their workflow in a more productive way, avoiding continuous interruptions and decreasing stress.